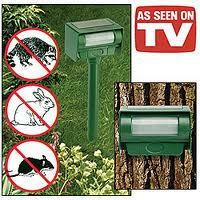 Bell and Howell’s Solar Animal Repeller As Seen on TV will keep all those unwanted guests, just the animal variety guys :), out of your yard, garden, garbage, or anywhere else you don’t want them. Solar Powered so you don’t have to worry about batteries, Solar Animal Repeller detects motion up to 30 feet and at a 70 degree angle. Once motion is detected an ultrasonic sound is released to scare the animals away. Safe and humane, Solar Animal is also super easy to install. You can either use the included garden stake or mount onto a wall or fence.